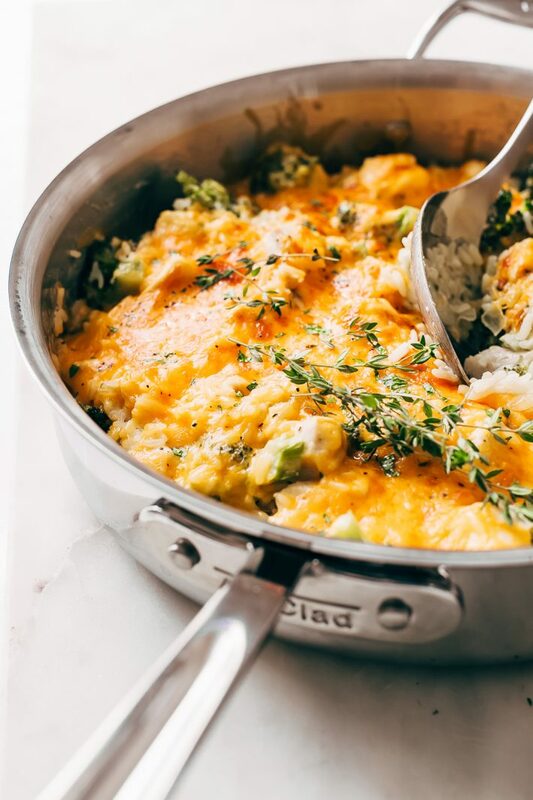 One Pot Cheesy Chicken Broccoli Rice Casserole made entirely from scratch! 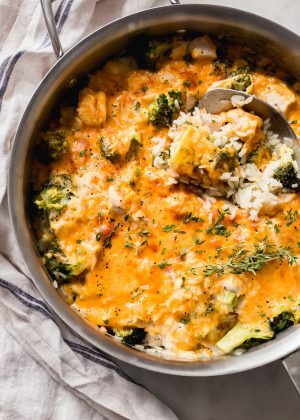 This broccoli and rice casserole tastes like risotto but requires much less work and is easy enough to throw together on a weeknight! Comfort food that comes together in a FLASHHH! And no I’m not talking about the adorable sloth from Zootopia! 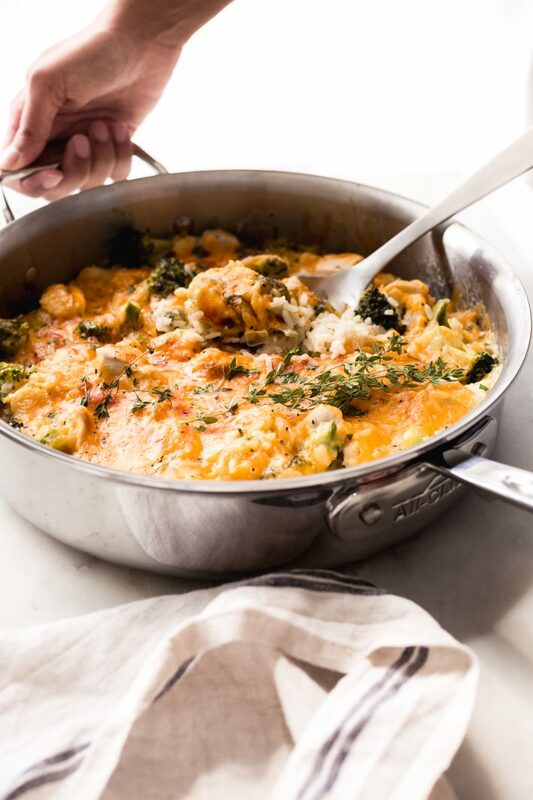 This one pot cheesy chicken broccoli rice casserole is not only a mouthful to say, but it’s sure to provide happy, full bellies because it’s the epitome of good comfort food. 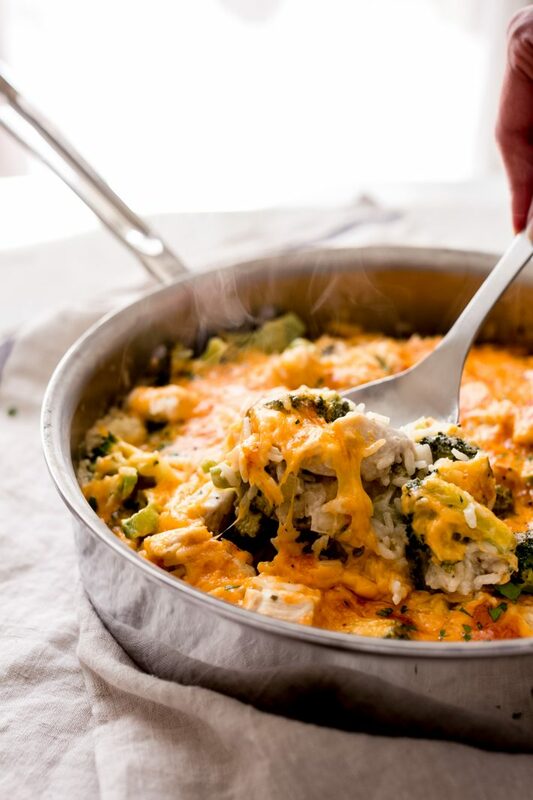 Today’s hearty chicken broccoli rice casserole is a complete meal. 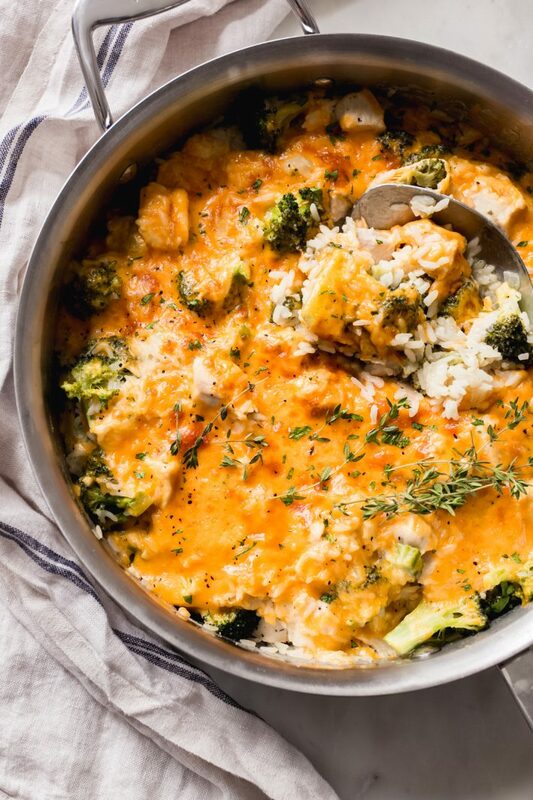 It’s got cheese on top; everything cooks in one pan and my favorite thing of all? There’s no cream-of-anything soup in this recipe. Casseroles are my jam in the fall and winter time. Speaking of, have you tried my chicken pot tater tot hot dish ? Side note: I’m two for two when it comes to recipe names that are a mouthful to say. Good lord, there isn’t a week that goes by where I don’t think about it. Crispy tater tots and a creamy pot pie were meant to be made together. I’m also a big fan of one pot dinners. In the past, I’ve made us a Greek chicken and rice dish  and now, this broccoli rice casserole. 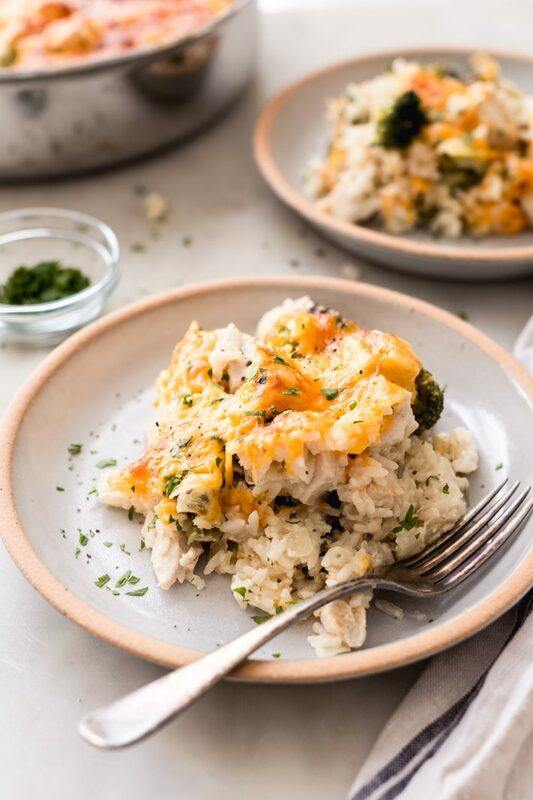 Chicken broccoli rice casserole is sure to please both the adults and the kids. The kids because there’s cheese on top and the adults because it’s more like a risotto that doesn’t require tons of stirring and complicated liquid measurements. Don’t get me wrong; the texture isn’t quite as soft as risotto, it’s a casserole after all, so the rice is perfectly al dente but creamy. Plus it’s all made in one pan so if you’re the one that cleans up, you’re probably doing a little dance in your head right now. WIN, WIN, and WIN. 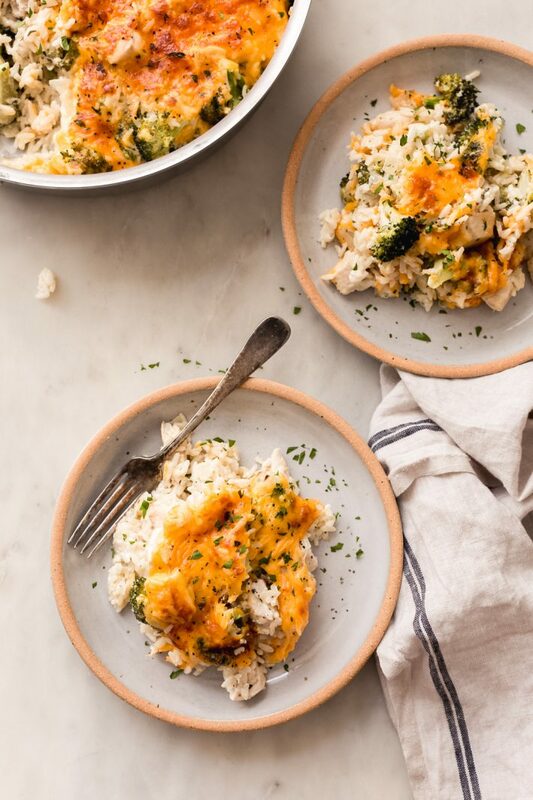 The inspiration for this chicken broccoli rice casserole admittedly comes from the chicken pot pie I was just talking about. That and the fact that I recently overheard a conversation at the grocery store where someone mentioned their family serves a broccoli rice casserole for Thanksgiving every year. So I decided to give it a go and add a little chicken into the mix. There’s a carnivore (poultrivore?) at home that’s very pleased with that decision. The first time I made this casserole, I didn’t go too heavy on the seasonings. Just a teaspoon of poultry seasoning. And though it was good, it wasn’t anything over the top or super impressive. The second time, I wasn’t messing around, I added a generous amount of ranch seasoning mix  (affiliate link.) Make sure to use the powdered seasoning not the prepared dressing here. What kind of rice do you use for a casserole? I’ve made this casserole with regular long grain white rice and parboiled white rice. Both work really well here. 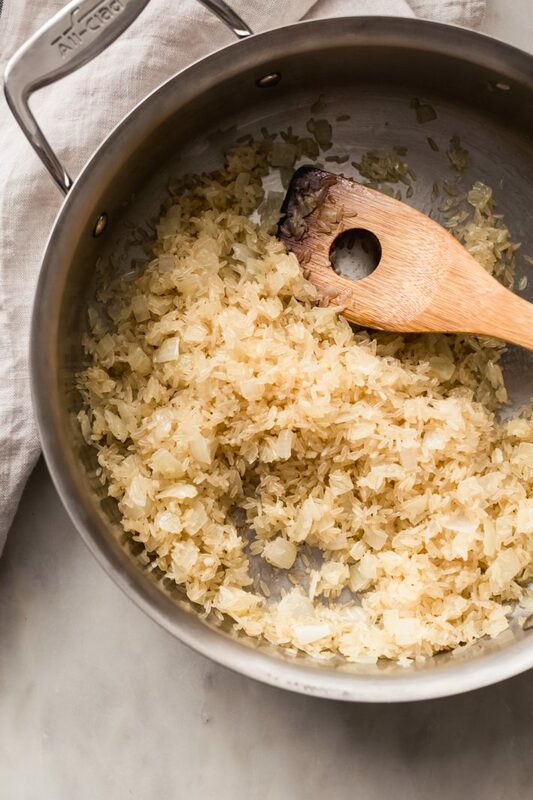 Start by melting the butter, let it get to the point where it begins to crackle and then add the onions and let them soften then add the garlic and saute it for 30 seconds. Then add rice and sauté it. Sautéing the rice in the butter gives it this nutty flavor it takes a couple of minutes, but I love what it does for the overall dish! Then add the chicken. Once you’ve done that, you’ll add the remaining ingredients: fresh thyme, seasonings, half and half, sour cream, a hint of mayo, and chicken stock. Notice how this recipe doesn’t contain any flour? I’m not the biggest fan of flour-based sauces for casseroles. The mayo + sour cream will help naturally thicken this casserole, so there’s no need for flour here at all. But also can we just stop and take a second to appreciate how amazing all of that is about to taste with ranch seasoned chicken? The one thing I absolutely cannot stand is mushy, overcooked, brownish broccoli. While testing this recipe, I tried using frozen broccoli and adding it in during different stages of the recipe. To keep things looking fresh, I like to add fresh broccoli florets during the last few minutes of the cooking time. I’ve tried adding it in with the chicken once, but it wasn’t anything I’d do or recommend doing. If you’re picky about your broccoli, do it this way. requires just a handful of ingredients that add tons of flavor! There you go, Monday night dinner is all taken care of. CHICKEN: Combine 1 tablespoon of ranch seasoning and the chicken in a bowl, set aside. SAUTE: Melt the butter in a large heavy-bottom pot. Add the onions and cook until softened, about 6-8 minutes. Add the garlic and sauté for 30 seconds or until fragrant. Stir in the rice and continue to cook for 1-2 minutes or until the rice is toasted and fragrant. SIMMER: Add the chicken and give it a 30-second head start before stirring in the remaining ranch seasoning, thyme, half and half, sour cream, mayo, chicken stock, season with a big pinch of pepper. Allow the mixture to come to a simmer, reduce the heat to low, cover and let simmer for 10 minutes. FINISH: Remove the lid, add the broccoli on top and gently stir it in. Cover and continue to cook for another 5-7 minutes or until most of the liquid dries up and the rice cooks through. Give the casserole a good stir, top with cheese, cover and let sit for 5 minutes so the rice has a chance to steam and the cheese melts. You can also pop your sauté pan under the broiler if you want the cheese to be bubbly on top, however, this is completely optional. Top with chopped parsley and serve immediately. You can replace the half and half with milk if you’d like this to be lighter but keep in mind that the casserole won’t be as creamy.